Microsoft has released a new version of WGA (Windows Genuine Advantage) Notifications for Windows XP that includes several important changes, and marks Microsoft departure from low-key anti-piracy effort in WGA after receiving too much complaint. WGA Notifications version 1.8.0031.0, released since August 26th, 2008, makes the notification of bogus non-genuine or pirated Windows operating system is now more prominent, and able to skip future notification of impending update on the tool. WGA Notifications is a second component of Microsoft genuine initiative that provides that warning messages and other on-screen prompts when WGA Validations (see information about WGA), detects a non-activated, failed-validation or pirated operating system. The update v1.8.0031.0, which has been specifically targeted to Windows XP, especially Windows XP Professional, the most pirated version of Wndows OS, will bring the “non-genuine experience” of Windows XP inline with WGA software changes made in Windows Vista SP1. With this update to WGA Notifications in Windows XP, we’ve implemented a couple of related features that draw on the notifications experience we designed for Windows Vista SP1. After installing this version of WGA Notifications on a copy of Windows XP that fails the validation, most users will discover on their next logon that their desktop has changed to a plain black background from whatever was there previously. 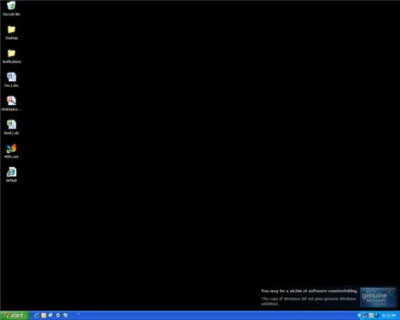 The desktop background can be reset to anything else in the usual ways, but every 60 minutes it will change back to the plain black background. This will continue to happen until that copy of Windows is genuine. Also, the user will see the addition of what we call the “persistent desktop notification.” This notification is similar to a watermark but works a bit differently. The image (see below) appears over the system tray and is non-interactive in the sense that you can’t click on it or do anything to it. The notification is, however, translucent and also can be clicked through and objects underneath it can be interacted with. In the screenshot here you can see (below) that the Recycle Bin appears underneath our logo. In this case, the Recycle Bin can be selected and moved about or right-clicked. The notification appears above any object on the desktop, but underneath open windows or applications. One of the reasons we’ve implemented the plain black background is to emphasize this new persistent desktop notification. As with the plain black background, the notification will continue to appear until that copy of Windows is genuine. All the annoyances are on top of existing nag pre-logon message, the logon interrupt message and the bubble notification messages that appear from the system tray (notification area). Worse still, Microsoft has decided to present a modified EULA (End User License Agreement) that forces user to agree to allow WGA Notifications and Validation Tool to auto-update and install themselves silently without further notice whenever new versions are released in future, on laughable reason to make the process simpler for end-users. Previously, all WGA related programs will be installed via wizard, which users can safely canceled. Microsoft plans to roll out the new WGA Notifications ver. 1.8.0031.0 and its successors to Windows XP Pro, and initially also editions based on Pro code such as Tablet and Windows Media Center (which will be bypassed in future too) only. Windows XP Home (and Windows XP Table Edition and Media Center Edition (MCE) in future) will continue to experience current WGA nags. WGA Notifications 1.8.0031.0 is delivered via Windows Update in phase starting from Wednesday, and the distribution may takes several months to complete. For users who can’t wait and want to get the ‘new experience’, a standalone version of installation file, WindowsXP-KB905474-ENU-x86.exe, has always available via Microsoft Download Center too. Surprisingly, no genuine Windows validation required to download the WindowsXP-KB905474-ENU-x86-Standalone.exe, or WindowsXP-KB905474-ENU-x86.exe. And, for users who have been troubled with non-genuine status and annoyed by the notifications, hackers have cracked this version of WGA Validation and Notifications.